Ah, Uplay, how PC gamers love you. Click on any Ubisoft game on Steam and if it requires Uplay to run you will often see glowing praise in the comments beneath; pages and pages of people excited to use the service. Oh, wait – I meant the exact opposite of all that. Sorry. Here are our Rainbow Six: Siege beta impressions. 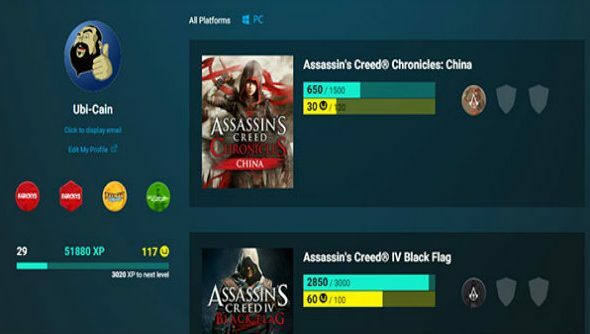 PC gamers hate Uplay, but at least Ubisoft are working on improving the service. This month’s update is one of the meatiest ones, and adds lots of features that will make it a much more user friendly experience. The Ubisoft Club lets you put loads of badges on your profile, which is, erm, nice. You also level up when you play more games, and you know how us gamers like watching progress bars fill up. Another new feature is news – now the latest news will show on a game’s page, letting you keep up to date with patches, DLC and more. The best new feature, though, is how you can link Uplay to your Steam account and import your Steam friends who have done the same. Now you just need to convince your friends to do that. If you do want to, you simply click on the Friends icon in the top right of the client, click “Add Friends”, and in the new window that opens select “Import friends from Steam”. The search will automatically start and once it is done you will have a list of friends that you can add in Uplay. You’ll also be able to customise your library, adjusting the sizes of certain titles to make them easier to spot. Additionally, look under “Downloads” and there’s now a download speed chart. Thrilling stuff, eh? If reading about all those features got you excited, why not drop us a comment and let us know just how excited you are.